A reminder that the monthly ARES Net for May is rapidly approaching. The monthly ARES Net for May is May 1st, 2006, at 8:30 PM on the MMRA Repeater system. This is after the RACES Nets earlier in the evening. Communications Night” and check into your local RACES Net and then check into the ARES Net on the MMRA Repeater System. We look forward to your participation and remember, we are always looking for Net Controls to run the ARES Net. For Amateurs who want to sign up for ARES and access the ARES Online Database and Registration Form to join ARES, click the Join Us link on the main menu of the ARES web page. For those that are already ARES members, in the next 1-3 days, we will be sending you’re login information including user ID and password if you have not already received it. Please let me know if you have any questions concerning the Eastern Massachusetts ARES Online Database and Registration Form. The following is an announcement on the new ARES Online Registration Form and Database. This writeup was put together by Mike Neilsen-W1MPN, Eastern Massachusetts ARRL Section Manager, Phil McNamara-N1XTB, ARES EC MARS Liaison, Carl Aveni-N1FY, ARRL Assistant Section Manager-Chief of Staff and South Shore ARES DEC and Rob Macedo-KD1CY, Eastern Massachusetts ARES Section Emergency Coordinator. This announcement was posted as a special message to the ARRL email list. Eastern Massachusetts ARES is pleased to announce a new method for radio amateurs to register with the section’s ARES program. Through the tremendous efforts of a team headed by Phil McNamara-N1XTB, we now have a new ARES online registration form and database for the Eastern Massachusetts section. Over the years, it has been very difficult to maintain continuity as people signed with the ARES program. With the ubiquity of the Internet, we now have a means that will allow people to register, and then receive rapid acknowledgement that their application has been received. Other powerful features of this database include allowing the user to self- update their information including response status changes, address and contact changes, new equipment or resources, and training from ARES, ARECC classes, SKYWARN Classes, and Incident Command System training etc. The database will also notify the responsible area DEC and the SEC that a new application has been filed, or the pertinent contact information has changed. Phil, N1XTB, has enabled people in the ARES leadership to be notified of your application (or changes to it), in order to more effectively manage their cadre. The new online ARES database will also send the individual an email acknowledging their session shortly after submitting their registration. The new registrant should then contact his DEC or the SEC for other email lists and information that may be available to him. Also, our local Emergency Coordinator’s will be given access to review ARES applications for their specified coverage area. As the ARES leadership changes, the database can be easily modified to maintain continuity. The Eastern Massachusetts ARES leadership successfully migrated the previous aging Microsoft Access database and integrated outstanding paper ARES Applications. This effort was spearheaded largely by the tremendous effort of Gil Follett- W1GMF, who updated over 300 people in the database, including call sign, name, address, phone numbers and email address. The Eastern Massachusetts ARES staff is very appreciative of his work. We are now asking that registrants fill in the remainder of the registration information and make any corrections. We feel that much of this information has changed since originally provided by you. Those Amateurs who do not have Internet access can still obtain the paper ARES registration form from your ARES EC, DEC, or SEC. The Eastern Massachusetts ARES staff encourages Amateurs to learn computer and Internet capabilities as working in today’s emergency communications situations usually require these skills. In the database inquiry form, you will notice we now ask for your date of birth information and a recent photograph. Since the attacks of September 11th, security has become a paramount issue to the agencies we serve. More questions are being asked prior to participation in federal exercises as well as some activation’s where the federal government is involved, resulting in their requiring our members date of birth data. As this information may be requested with little or no advanced warning, we encourage all participating Amateurs to put this information into the database. You can be sure that the information will only be utilized when it is required by a served agency for ID card preparation. Please be advised that without this information, we may not be able to make you available for operations such as Operation Atlas or TOPOFF-III where the DHS requires this information in order to participate. This information improves our readiness for a major disaster response. During the testing and data entry phase, some of you may have received a message stating a registration has been submitted for ARES. This was due to having the email mechanism turned on during testing phase. We understand some of you may have deleted this message as spam. After this press release circulates via email lists over the next few days, you will receive an email concerning your registration with login information. At that time, we ask that you login and update your record accordingly. Please take the time to update any training at the link at the top of your record page. There may be some concern about privacy, hackers and spammers. Phil, N1XTB, keeps the site updated with the latest security patches. The information that you provide is protected by the same robust technology used in credit card transactions and online banking. We are most fortunate to have received the benefit of Phil’s expertise with online database development work. He deserves a tremendous amount of credit for giving the gift of his time and abilities to the section on this project. Phil has been a huge asset to the section having assisted with the many ARES and SKYWARN activations over the past several years. If you have questions, comments, or concerns, please email Rob-KD1CY, Eastern Massachusetts ARES SEC at kd1cy@ema.arrl.org and he will get back to you ASAP. Thank you all for your continued support of Eastern Massachusetts ARES! We hope you will see this new online registration form and database as a huge asset to our section! On Christmas Eve, 1906, instead of a Morse code message, Fessenden made the first voice radio broadcast heard by Navy ships and ships of the United Fruit Company that carried his radio equipment. Dave Riley, AA1A of Marshfield believes that Reginald Fessenden could truly lay claim to be the inventor of radio but never received his due recognition. Until last December, when an article appeared in the Patriot Ledger, I suspect very few Whitman ARC members, aside from John Coombs, WQ1L of Marshfield, had ever heard about Reginald Fessenden. Friday, April 14, 2006 just happened to be the day a group of Air Cadets would be camping at the remains of the Fessenden tower/radio station site in Machrihanish, Scotland and the US Civil Air Patrol (CAP) was asked to set up a special event Station at the Brant Rock antenna site and make contact with the Air Cadets in Scotland. 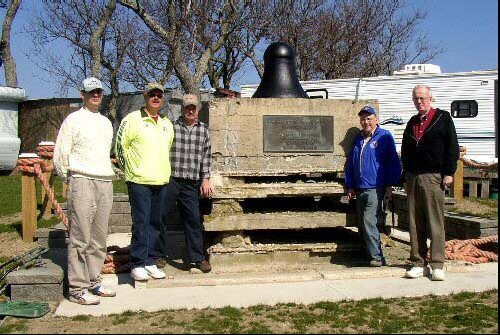 Pi Pugh, K1RV and the K1USN amateur radio crew were contacted and invited to participate by Dave Newman WB1EVP, the CAP Project Officer for this activity and a local ham who is part of the local K1USN/Marconi crew. Pi, K1RV and the K1USN crew supplied the amateur radio HF and VHF transceivers and antennas. Both a Cushcraft R-5 vertical and a long wire antenna were installed for HF. The CAP crew had no problem making their scheduled contact. Shown here (l. to r.): Bill O’Hara N1EY; Pi Pugh, K1RV; Walt Fitzgerald, W1WCF; Bruce Hayden, NI1X and George Glisham, W1YR. Also participating but not present when the picture was taken were: Dave Riley, AA1A; Ralph Butler, W1BT; Tom Wilson, KB1TOM and Dave Hill, N1GXV. It was interesting to note that several CAP member present had their amateur radio licenses. Ham classes (see “Technician Class In Taunton”) conducted at the City of Taunton have finished as of April 23, 2006. Shown here are some of the class participants, along with NI1X, WP4US and KB1LXH. Nashoba Valley ARC members recently assisted a local scout troop in obtaining the Radio Merit Badge. Dan Rasmussen, the Troop 3 Scout Master from Groton contacted Stan, KD1LE asking for help with the Radio Merit Badge. 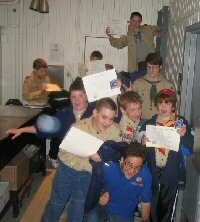 On March 24, 2006 NVARC members helped Groton Troop 3 Scouts fulfill requirements for the Radio Merit Badge in Amateur Radio at KD1LE’s QTH. Joel, W1JMM and Stan, KD1LE first put the Scouts on the air to satisfy one of the requirements. In various combinations the Scouts talked to Larry, KB1ESR and Dave, N1MNX/m on the six meter repeater. Some spoke with Ralph, KD1SM in Cambridge on the Boston two-meter repeater. Several spoke with Bob W1XP/4 at his North Carolina QTH. After the on-the-air part, Joel and Stan covered the other requirements with a presentation explaining repeater operation, the various aspects of Amateur Radio, how to get licensed, QSL cards, the many operating aspects of Amateur Radio, emergency communications, public service and quite a few other requirements. After a question and answer session we went back to the “shack” to point out various pieces of equipment and its function. Thanks to everyone who helped out. About thirty boy scouts were taught theory and operated the W1AF station as part of a Radio Merit Badge Course set up by Harvard Wireless Club President Matt Gline, KG2OT for the annual Boy Scout Medal at Harvard College. You and your club members are invited to join us on May 6, 2006 as an exhibitor, participant, or both. Display your colors, attract new members, and participate in the excitement! For the past two years National Astronomy Day at the Clay Center Observatory has been a fantastic educational event that has brought in many hundreds of families from around the greater Boston area and from as far away as Rhode Island and New Hampshire. We co-host the event with the Amateur Telescope Makers of Boston (ATMoB) who bring many types of solar and night telescopes to the event. In addition we will have three planetarium shows, a LASER light show, Galileo himself, NASA ambassadors, guest speakers and lecturers, and rooms filled with activity tables and displays on all kinds of sciences. For details, see http://www.claycenter.org/astro. I would like to offer your non-profit organization a table at this event at no cost where you can proudly display your banner and photos, recruit members, and even sell club related items. All I ask is that you offer some kind of hands-on educational science activity (should be somewhat connected to astronomy or earth science). The activity should be geared for children or scaleable to all ages. If you can join us, please go to the Astronomy Day web site at http://www.claycenter.org/astro and register in the vendor/volunteer section. You and your helpers will receive name badges and boxed dinners. Even if you don’t want to run a booth or table, feel free to bring your club or scout group for a fun afternoon or evening. Free admission! Come anytime to each or both. Free Astronomy Red Light on a keychain for first 300 children! The Clay Center will hold astronomy day events in collaboration with the Amateur Telescope Makers of Boston (ATMoB). Many activities have been planned for families and children of all ages. * Many different telescopes will be set up for you to see and use. Safely view the sun in the daytime, and see the moon and stars in the evening, weather permitting. * Demonstrations, lectu res, planetarium shows, LASER Light show, rocketry, stunt kites, celebrity appearances, educational activities for all ages. * Astronomy Show by astronomer Ron Dantowitz about telescopic coverage of historic SpaceShip One launches and the famous Laser-to-Space-Station project last spring. The March, 2006 EMA traffic net and Public Service Honor Roll totals have been posted to http://nts.ema.arrl.org under “Main Menu | STM Monthly Report“. The Charles River Watershed Association (CRWA) has again requested ham support for the Run of the Charles (ROTC) canoe races. Some administrative delays have caused time to be short and your prompt response will really help. Fortunately, the river and race conditions have not changed much in recent years. This event, like so many others in the Greater Boston area, has been coordinated by or through the Boston Amateur Radio Club. I manage the public service activities for the club. We should all be aware of the critical nature of this event and the restrictions it imposes on the ham support. I intend to continue that concept. As I increase the number of hams needed to do this job, I plan to be selective of ham quality. To manage this I ask that you respond to the questions below as quickly and as accurately as you can. Email will be the primary means of communication between us. This year the ROTC will be on Sunday, 30 April 2006. Some assignments will begin as early as 0700, others somewhat later. As in the past, our duties are primarily safety and administrative at the dam portages, as well as shadows for key CRWA staff and at Net Control. A 2-meter, 5 watt hand-held is satisfactory. A dual-band radio is desirable, but not required. An antenna better than the “rubber duck” that came with the radio is essential because the riverside locations may make communications difficult. Be sure to have sufficient batteries to last the day. I will furnish you with assignments, more details and instructions as soon as the information is available. As a ham event, this is an interesting and fun experience. The communication load is light, but that doesn’t begin to compare with the problems of handling canoes in a rushing river. The CRWA emphasizes safety and care for the participants, so wetness is frequent and accidents are few. If you can help for this event, please respond with all of the following information as soon as possible. Reply by email is the best method. Does your 2-meter radio have CTCSS (PL)? Do you have a dual-band radio? Also, with regard to this event, let me know your station preference(s), if any, and time of assignment desired. Note that we cannot assure you that all preferences can be granted. Depending on the responses received, there is a slight chance we cannot use all volunteers. Try to get back to me as quickly as you can. If you know other hams who would meet the ROTC quality standards and are interested in this event, ask them to send the above information to me. The Boston Amateur Radio Club has been invited to participate at the Blue Hill Observatory Spring Open House on Saturday, April 29. Open to the public, this is a great opportunity to introduce ham radio to kids and adults alike. Attendance is expected to be more than 1500. The event runs from 1000 to 1600, with our set-up beginning at 0800. We will be operating on 145.230, 146.520 and on HF. Our past experience operating from that location during SKYWARN Recognition Day indicates that 2M VHF contacts are possible all over New England. Transportation to the top of the hill will be by shuttle service from the parking lot located at the base of Great Blue Hill on Rt. 138 in Milton – unless you would like to hike the 653′ elevation. I also suggest bringing a lunch and something to drink. Those interested in assisting please contact me by e-mail at emgmgt@comcast.net or at 781.749.7664. 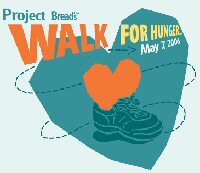 Project Bread will again be looking forward to hams supporting the Walk for Hunger on Sunday, May 7. Forty thousand walkers will be raising funds for emergency feeding programs located across the Commonwealth. This will be the twenty fifth time Amateur Radio will be part of the Walk organization. The assignments are about six hours long at various places along the twenty mile Walk route from Boston out to Newton. Some positions start at 6AM with others starting throughout the morning. We need coordinator shadows at checkpoints, bus stops, with walker marshals, and in transport vans. All skill levels of hams are desired. A two meter or dual band radio with extra battery and an extended (15 inch) antenna are needed. An informational meeting and two on air sessions will be held to answer questions and fill in last minute details. You can sign up at the Crocker Public Service Group web page http://cpsg.amateur-radio.net/ or send a message to wfh06@amateur-radio.net. High praise was received last year from the coordinators and the Project Bead staff for the quantity and quality of support by hams. Three million dollars were raised even with the rain showers. More information about the Walk and the services Project Bread provides can found at http://www.projectbread.org/. The event is an enjoyable day with both the walkers and volunteers having a good time at this worthwhile cause. Does anyone know of any reputable techs that have experience in repairing and or restoring back to specs boat anchors? In particular, I am trying to find someone for a blind friend of mine that needs his R390 “tweeked”. If you can help via your own experience with a reliable tech, please email me at:  akm_325@yahoo.com. Thanks. Dah dit/di dah dah dah dah/Dah di dah/Dah dah di dit/Dah di dah dit. The Framingham Amateur Radio Association plans to be on-hand at the upcoming Emergency Preparedness Exposition on September 16, 2006 on Pond Road in Framingham. The event is being sponsored by the Knox Trail Council of the Framingham Boy Scouts. “They are expecting between 700 to 1,000 attendees for the event,” writes Framingham ARA president Gordy Bello, K1GB. “FARA will be there with a booth depicting ham radio’s role in emergency communications.” He adds, “We will be handing out brochures, flyers, etc. and [operating our handi-talkies]  for demonstration purposes. The Expo will feature organizations such as: NSTAR, the FBI, Framingham Fire Department, and Framingham Police Department. Lunch will be provided for those participating. Mark your calendars for the 32nd Eastern VHF/UHF Conference, April 21-23, 2006 at the Crowne Plaza Hotel in Enfield, Connecticut. The conference is an opportunity to share with fellow VHFers and above technical achievments in the field of communication and experimentation. It will feature technical talks, photo displays, band sessions, noise figure measurements, and much more. For additional information, visit http://www.newsvhf.com/vhfconf.html. An interesting thread on the Harvard Wireless Club (HWC) email reflector discusses who has legitimate claim to being the oldest college radio club in existence. A reminder that the monthly ARES Net for April is rapidly approaching. The monthly ARES Net for April is April 3rd, 2006, at 8:30 PM on the MMRA Repeater system. This is after the RACES Nets earlier in the evening. (c)2006 W1GSL   http://www.swapfwst.us        SASE for updated copy as issued.